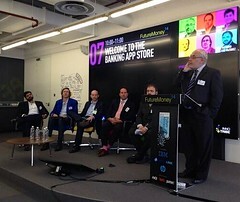 APIs will certainly revolutionise the services the banks provide, but they will also revolutionise the way banks work. Edward Budd from Deutsche Bank, Udayan Goyal from Anthemis Group, David Pope from Jumio, Simon Redfern from Open Bank and Jose Antonio Gallego Vázquez from BBVA. After some initial confusion about the relationship between the colours of the chairs and the colours of the pictures behind them (!) I made a few introductory comments about APIs in this sector and why I felt this was a strategically important discussion. Following that, we began to examine some of the questions that I had prepared to challenge the panel and brought in questions and observations from the floor to follow. Though I say so myself, it was a terrific session and I would like to broadcast my sincere thanks to the other people who said so too, including Richard Brown from IBM. Given that here both his topic (banking apps and APIs) and panelists were genuinely interesting, it is no surprise that it was perhaps the best session over the two days. Richard and Zilvinas are very kind. The reason that the session was such a joy, and was much appreciated by the audience, was that the panelists had exactly right mix of expertise and experience to tackle such a hot topic. I had a bit of an inside track as well, since Consult Hyperion carried out an extensive study of the financial services API world for one of our US customers last year, so I had a pretty good overview of the space in my head to help to shape the discussion. You can read the liveblog for yourself at Finextra, but I want to highlight a couple of what I thought were key points here. Secondly, APIs are not all about organisations connecting with other organisations. They are also a way of restructuring the way that bank systems connect internally. This was referred to as “Amazonisation”, the idea that every single corporate function should expose its APIs, because other functions within an organisation might be able to do something useful with them. Uday used the excellent example of Fidor Bank as an organisation that has taken those axioms to heart internally. We decided from the beginning to build our own middleware, because there was no suitable offer in the market. This is what we now call “Fidor operating system”… fOS is an “open” System. Via standard interfaces we integrate 3rd party offerings into our account. In our Consult Hyperion “hot five” for 2014, we highlighted the importance of APIs as part of an electronic transaction strategy and this panel confirmed, to me at least, just how central that API strategy should be to organisational strategies. And they also underlined one of my key messages to our clients: this is business strategy, not technology strategy. APIs are, at their core, not a technical device. Instead, they are a means of delivering or providing access to a service or a product. So thanks again to Liz and the rest of the Finextra crowd for giving me the opportunity to learn so much from a terrific panel. Axiomatic subject matter executed with absolute clarity. Kudos. Points 4 and 5 are critical. APIs aren’t a channel or a product. They’re a strategy that starts with wrapping your internal systems in cotton APIs and ends with being the Salesforce of banking. ← Bitcoin? Yes and no.